A couple of months ago, I was finishing up an assignment for one of my classes the night before it was due. Everything was going swimmingly, until my computer, for no apparent reason, shut down. I freaked out a bit. It was not a big assignment, but it was long enough that I would have had to spend a couple more hours trying to finish it. With my heart thumping, I attempted to turn my computer back on. Nothing. I opened it up and prodded around, but still I could not figure out what had happened to cause it to break. The file was saved, but I had to upload the assignment online, and the only copy I had was on the computer. What followed was me attempting a couple of different solutions, all of which failed. I took out the hard drive thinking nothing was wrong with it, and used some parts I had lying around to try and connect it to my laptop, which did not work either. With most of my solutions exhausted, I had to go to the nearest store to buy something to connect the hard drive through some other connection, which was not SATA, to my laptop and grab the file from there. This ended up costing me more money than I would have liked, and I definitely learned my lesson: Back up your files as you go. From then on, I would email half completed and completed assignments to myself, but luckily I have not run into the same problem since. However, we can all agree the importance of backing up your files and even your entire system. Today, we will be looking at Acronis True Image 2017, one of the most well-known and popular back up software promising more than just back up. Read on to find out what they are! Installing and setting up Acronis True Image 2017 was a breeze. The entire process is streamlined to make it as easy as possible to reach the first page pictured above. After signing in and activating the software, I was met with the most important feature of the Acronis True Image 2017, which is backing up your computer. As you can see, the first page has a clean design; simply laying out all the different components of the program. The dark blue column toward the left functions as the map for the software. This column makes navigating the Acronis True Image 2017 simple and straightforward. Throughout my use, I never encountered the program slowing down, random spikes of lag, or even random crashes. 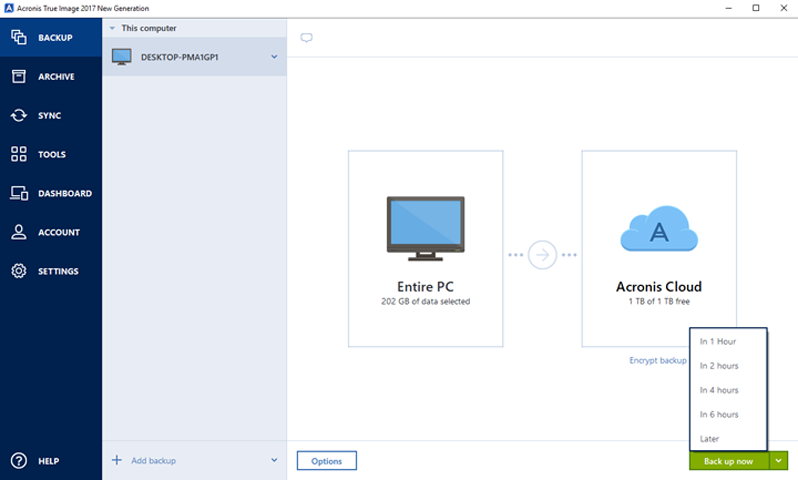 All in all, the Acronis True Image 2017 definitely makes for a user-friendly experience. Backing up is really important for a multitude of reasons. My introduction story stresses the importance for university work, even though it was a smaller assignment, something similar can happen for a research paper, perhaps even a master's thesis. Losing this work can have many different outcomes, all of which are terrible. Many different reasons cause work to be lost such as disk failure, viruses, ransomware, perhaps even accidentally deleting important files. There are many things that could go wrong, which ultimately stresses the importance of backing up your data frequently. In the case of ransomware, Acronis has taken an active approach to protect data instead of backing up and recovering after data has been lost. As a result, Acronis True Image 2017 has Active Protection against ransomware. However, this feature is only available to premium subscriptions. Acronis also has end to end encryption using the AES-256 standard. Acronis' active approach to protection is definitely a benefit above other free or less expensive software providing backup features. There are even more security features such as Acronis Notary, which ensures the authenticity of data by seeing if it is changed using Blockchain technology. Ideally, this feature is for immutable data storage, secure time stamping, and public audits. Lastly, there is also Acronis eSign allowing for electronic signatures to be added to a document. All of this demonstrates the importance of backing up your data, and Acronis makes this process easy and safe. Since the main feature is backing up your computer, the first page is all about it. Right next to the dark blue column there is a list of all the backups you currently have. The process of setting up a new backup is straightforward. Close to the bottom left there is an "Add Back Up" button. Clicking this button will allow you to enter a name for the new section. The down pointing arrow is another option to add an existing backup to the list, which is quite useful if you have already performed the function. After deciding on a name, the next step is to decide what to back up; either the entire system or selected files. By default, the entire computer is selected; however, selecting the computer allows one to choose specific files or sections of the computer. After deciding on which files to back up, the next step is to choose a destination, which I explain more about in the next paragraph. To the bottom right of this image, we find the backup button. As you can see, there are some options, either backing up right now or choosing a later time. Furthermore, the options button in the bottom center allows for a couple more functions. These functions are to set up a schedule to your liking, setting up notifications, which files to exclude, and lastly, an advanced settings tab to add an encryption password. In my opinion, Acronis True Image 2017 make it quite easy to make a backup, but it takes the time and effort, as well as subscribing to this service, to actually perform one. This process should be scheduled weekly, monthly, and perhaps even daily if there are large amounts of new important data. There are a couple different choices for where the backup will be saved. The first option is the Acronis Cloud. The subscription is what determines how much storage you can use on the cloud. The standard subscription allows for up to 50 GB of storage, while the premium allows for up to 1 TB. Acronis True Image 2017 allows you to select the data center closest to you for optimal upload speeds. However, if it is a sizable upload, it will still largely depend on your internet connection to make this feature worth it or not for you. If you are fine with longer wait times, then this is really useful. I must note here accessing the cloud is a slow process. The next choice is a bit more local; directing saved files onto an external drive. Otherwise, the other options are to a protected spot on the same hard drive, an FTP connection, or a NAS, otherwise known as a network attached storage system. The backup can also be encrypted; just remember the password cannot be recovered, so do not forget it. 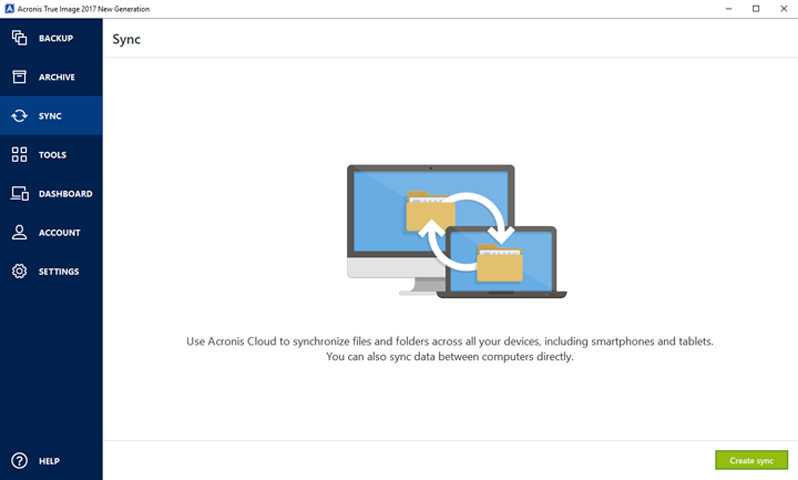 Acronis True Image 2017 features cloud storage integration, but as I have stated, how comfortable you are using it depends on you and your upload speed. Even accessing the Acronis Cloud is a slow process, which makes this process a bit more frustrating. The advantages of a cloud backup is that it can be easily accessed anywhere you are. However, there is a viable and effective middle ground between cloud storage and using an external drive, which is probably one of the best options for backing up your system. This alternative is a network attached storage, also known as a NAS. A NAS gives you the benefit of a private local cloud system. Backing up onto this system and accessing your saved files is faster compared to Acronis' Cloud. We recently wrote an article called The 32TB NAS Setup: Striking the Sweet Spot, which takes into consideration the different hard drives to use and how they play into the NAS used. Another useful feature of the Acronis True Image 2017 is archiving certain files. Acronis will move old or large files from your computer onto a location of your choice. Acronis even scans the computer for you, and suggests different files that you might want to archive. 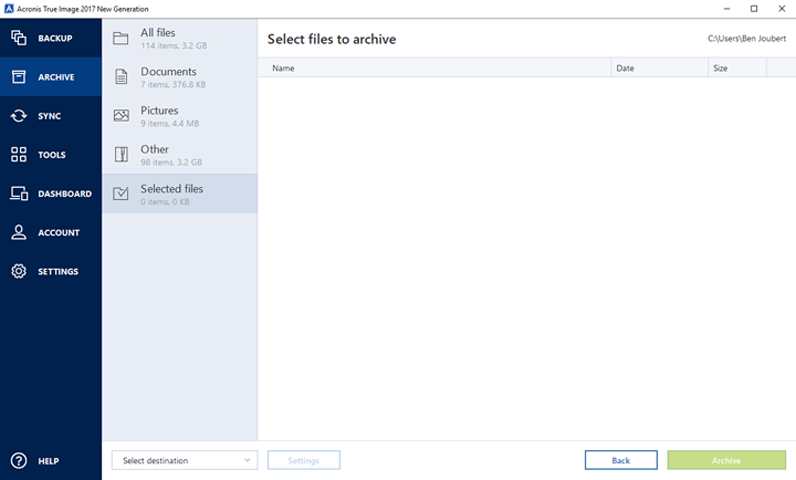 Local copies get deleted in the process, but the archived copies can still be easily accessed through File Explorer by selecting the Acronis Drive and navigating to the files. They can also be accessed through your web browser by signing into the Acronis Cloud. This is quite useful, but it really is only for older files or ones you do not frequently use, since navigating through the Acronis Drive in File Explorer is a bit slow, but no more than expected from accessing files over the internet. I found logging into the Acronis Cloud through my web browser to be the most annoying, as this is the slowest process and I had to wait quite a while just to go into the selected folder. The sync function makes the Cloud even more useful. The sync function is mostly self-explanatory, but Acronis True Image 2017 ensures the entire process is smooth, taking you step by step. 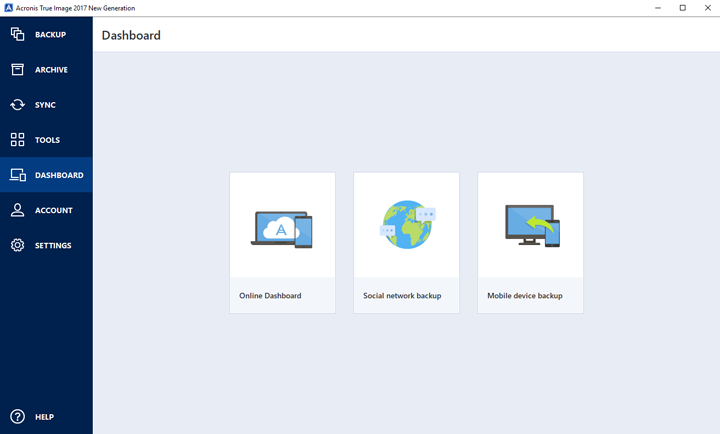 The different options are either syncing through the Acronis Cloud or from one computer to another. This also works for smartphones and tablets, making it especially easy transferring different files from a computer to a phone or a tablet, even between different operating systems, as you can select individual files to sync. The dashboard tab houses a couple different features. First up is the online dashboard. Selecting this icon opens up your web browser where you can control most of the functions of the Acronis True Image 2017 software; namely the backups, archives, and synced files. However, as aforementioned, navigating through the different functions is a bit slower than expected. Next is social media backup. This will store any videos and photos on Facebook; even comments, events, and liked pages. Social media backup is just for Facebook; not Twitter or Instagram or any other social media platform. Setting up this backup is just as easy as the usual, but it is accessed through your web browser. Lastly on this page is mobile device backup. This can be used for Android or iOS devices. Again, Acronis True Image 2017 has done well in ensuring this is an easy and simple process. All the process entails is downloading the application to your phone or tablet, start the backup creation process on your computer, and scanning a provided QR code with your phone. From there, you proceed with the rest of the backup on your phone, selecting what you want backed up. 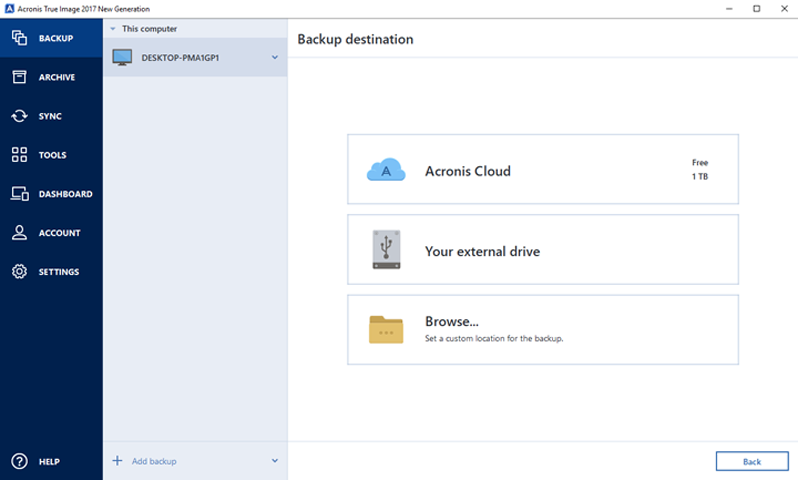 The backup can be saved to the Acronis Cloud or your computer, and it is done over a Wi-Fi connection. Furthermore, the frequency of this back up can also be set, ensuring any new files get automatically stored. The tools tab houses all the other periphery functions of the software. Many of these are self-explanatory, but they are quite useful for the safety of your data. You can clone your hard drive, effectively making a system image. There is a "try and decide" function, which allows you to run unsafe operations without fully committing to them. System Clean-Up wipes the entire computer, while Drive Cleanser will only wipe the selected drives. 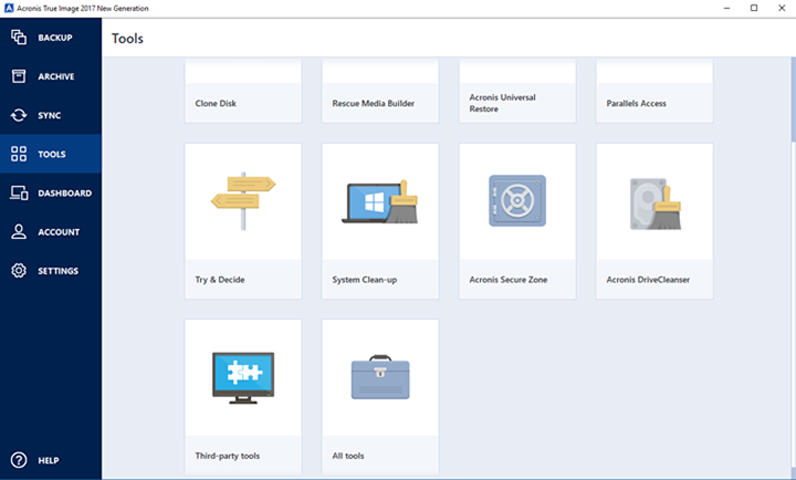 Acronis Secure Zone is a useful tool, as it creates a safe partition on your hard drive for a backup. This feature can be important if you do not have any external drives or a NAS system to back up your system. Third party tools opens up your web browser where it will list some extra tools you might find useful. As you can see, there are quite a few more options here to make the experience easier and safer. Acronis True Image 2017 has many different features, all of which are to make the process of backing up and securing your files a breeze. This sits in contrast with some other free backup software, such as some of the built-in Windows features. The Windows backup is not entirely bad, but it is simple without much extras. There are no security features, of which there are plenty for Acronis True Image 2017. Furthermore, Windows does not have archiving functions, sync functions, mobile backup, secure zones, and an online dashboard where all the different backups can be managed. Comparatively to some other software, where Acronis True Image 2017 really stands out is its active approach to securing your files on top of providing an easy way to back up all your data. Keeping data safe today is definitely an important step, especially with how much data a person produces. While the frequency of backing up can depend on how much data one produces, backing up in general is a crucial step to take. Acronis True Image 2017 is an effective data protection software; offering plenty of features to make backing up a smooth and efficient process. There are two different subscription offers for the software; the cheaper option has 50 GB of cloud storage, no active ransomware protection, and no file certification and electronic signatures. The premium subscription has 1 TB of cloud storage. There is currently a special on both subscriptions; the standard is $40 USD for two years, while the premium is $100 for two years. Besides the cloud storage being a bit slow and difficult to access, Acronis True Image 2017 is a a great package for home and office users alike. I found no issues throughout my use. The premium subscription is quite a bit expensive, but reasonable considering the features. The security features of the premium subscription are definitely important. However, since the price for the premium subscription is on the expensive side, with many extensive features a day to day user will not uses, ensures the software leans more toward power users and small businesses, while the standard subscription is more for everyday users. Acronis True Image 2017 is a powerful piece of software, making backing up on more than just your computer a breeze. Acronis True Image 2017 is a powerful piece of software with plenty of features, while its two different subscriptions make it a viable option for people with different needs. Do you have any comments or questions about the Acronis True Image 2017? Drop by our Forums. Registration is free, and it only takes a minute!